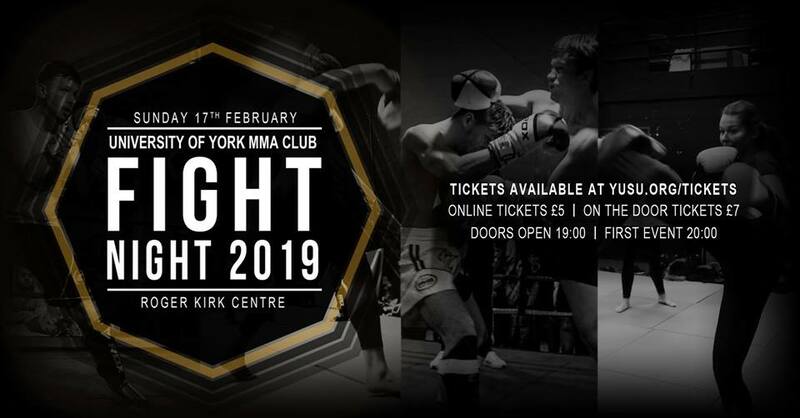 The University of York MMA Society presents its annual University Fight Night! Come along and watch some of the club’s top fighters compete against each other in full contact K1 Kickboxing, and Mixed Martial Arts bouts. This is not an event to be missed! Whether you’re passionate about combat sports, or have never watched a fight before, get yourself and your friends down to the Roger Kirk Centre on 17th February to see what we’re all about. Our fighters have been training hard all year to put on a performance in the cage that is sure to impress, with a range of weight classes and fighting styles. All profits raised at this year’s Fight Night will go to York Mind, and Cardiac Risk in the Young (CRY). Two great charities – check out what they’ve been doing in the links below. Doors open at 19:00, and the first fight begins at 20:00! Tickets are available online this week for just £5, and will also be available on the door for £7.